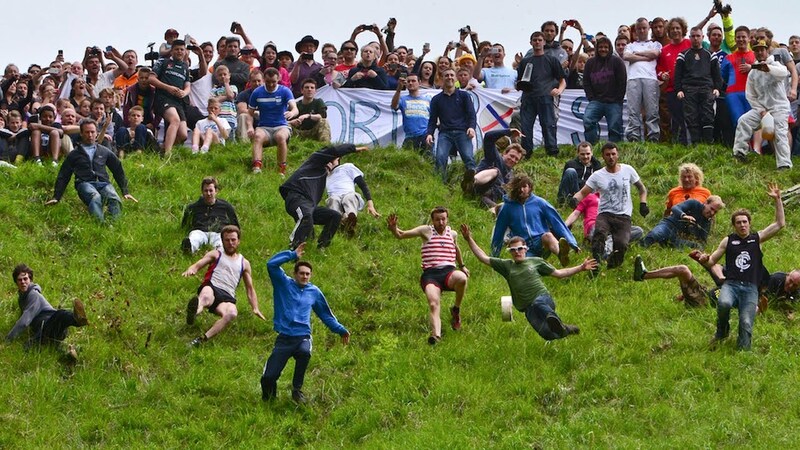 Once just a village tradition of chasing a massive cheese roll down an epic hill has become an international event that lends itself to expertly insane slow-motion video captures. At the beginning of the week, the county of Gloucestershire takes place in the annual Gloucester Cheese Roll. Men, women, children, and all-around go-getters insane people pursue a hefty cheese wheel that can reach up to 70mph going down Cooper's Hill. What makes the Spring Break Holiday event so crazy is the carnage that is inflicted on participants who roll, tumble, face plant, dive, tumble, slip, twist, and gasp for air as they try to catch-up to the cheese. Luckily, fearless videographers captured all the best falls—making the event look more like a scene from the new Johnny Knoxville film Action Point.